Attorney, business woman, and community advocate, Melinda Guzman is one of Hispanic Lifestyle’s 2013 Latinas of Influence. Melinda Guzman is sole shareholder of Melinda Guzman, Professional Corporation, a certified Woman and Hispanic owned law firm. She is a partner of Goldsberry Freeman & Guzman, LLP and a former partner of Diepenbrock, Wulff, Plant & Hannegan, LLP. Ms. Guzman’s practice focuses on representing private and non-profit corporations, foundations, media interests (radio, television and print media), venture and equity capital firms (in acquisitions, financing, and collections), insurance carriers, and other business interests. She is a proven litigator, an effective business negotiator and work-out counsel, and is highly regarded for her mediation skills. Ms. Guzman is also a dedicated public servant with expertise in finance, governance, employment, higher education and business. She is highly regarded for her work on governance issues and she is a noted speaker and trainer on the fiduciary duties of officers and directors of boards of directors. She is a proven leader with a confirmed track record. Ms. Guzman has served as a director for the Federal Home Loan Bank of San Francisco since 2007. The Federal Home Loan Bank of San Francisco delivers low-cost funding and other services that help member financial institutions make home mortgages to people of all income levels and provide credit that supports neighborhoods and communities. The Bank also funds community investment programs that help members create affordable housing and promote community economic development. The Bank’s members—its shareholders and customers—are commercial banks, credit unions, savings institutions, thrift and loans, and insurance companies headquartered in Arizona, California and Nevada. Ms. Guzman also served as a director of Pac-West Telecomm, Inc. from 2004-05. Pac-West Telecomm, Inc. is a publicly traded company located in Stockton, California and is one of the largest competitive local exchange carriers headquartered in California. Ms. Guzman served as General Counsel of the United States Hispanic Chamber of Commerce (“USHCC”) and of the United States Hispanic Chamber of Commerce Foundation (“USHCCF”) from 2004 – 2010. These organizations represent the interests of over 3 million Hispanic-owned businesses in the United States and Puerto Rico. She serves as General Counsel to the California Hispanic Chambers of Commerce (CHCC), is the Past Chairwoman of the California Hispanic Chambers of Commerce (CHCC) and a Past President of the Sacramento Hispanic Chamber of Commerce (SHCC). With over 22 years of work with chambers of commerce, Ms. Guzman is highly regarded for her work with small businesses to help grow and develop this important economic base. 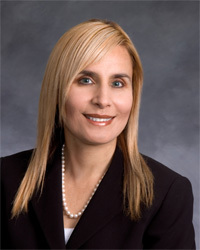 Ms. Guzman was appointed by California Governor Arnold Schwarzenegger to serve as a member of the Board of Trustees for the California State University system (2004 – 2012). The California State University is the nation’s largest university system. She served as a Commissioner for the California Post-Secondary Commission, which serves as the state’s planning and coordinating body for higher education from 2006 – 2011. In 2003, she was appointed by Governor Gray Davis to serve as a member of the Board of Governors of the California Community Colleges. Ms. Guzman was appointed by California Insurance Commissioner Dave Jones to Chair the California Insurance Diversity Task Force to explore issues regarding diversity in the insurance industry in governance, philanthropy, supplier diversity and member issues. She also served as Chair of the Nehemiah Corporation of America, one of the nation’s largest down payment assistance programs for new home buyers, and as a member of the Board of Trustees for the U.C. Davis Foundation. She has served on the Board of Directors for the Make A Wish Foundation and the Davis Community Television Board of Directors from 1990 to 1995, and served as its President in 1995. Ms. Guzman provides on air talent for DCTV productions, including Davis Dialogue and has provided commentary for DCTV’s campaign coverage. She has also served on the Comstock’s Club and KVIE Channel 6 Board of Directors where she chaired the Community Advisory Board and serves as talent for special on air productions. Ms. Guzman is a Board Leadership Fellow of the National Association of Corporate Directors. She is a member of the National Association of Corporate Directors; Sacramento County Bar Association; State Bar of California (Member: California Minority Counsel Program; Former Member: Executive Committee, Law Practice Management Section); La Raza National Lawyers Association (Vice President, 1989); and Women Lawyers of Sacramento (former Board member). Ms. Guzman has been recognized as the “Latina Leader of the Year” for 2011 by the Latino Journal Magazine, with the national “Latina Leadership Award” by Latino Leaders magazine in 2008 and was named one of The 100 Influentials by Hispanic Business magazine in 2004. She has also been honored by the National Association of Women Business Owners with the Luminary Award for her leadership in business, by the Sacramento Hispanic Chamber of Commerce as its 1999 and 2005 Business Woman of the Year, by the Sacramento Business Journal as its Top “40 under 40″dynamic young achievers and by Univision and McDonalds Corporations for her leadership in the Hispanic Community. She is a well respected business leader for her ethics and integrity and is recognized for creating and developing programs that promote education and business growth and development and for expertise in corporate governance and venture programs. Ms. Guzman was born and raised in Fairfield, California and is the daughter of the late Amado Guzman and Anita Guzman of Fairfield. Ms. Guzman is a first generation college graduate of the University of California at Davis (B.A., 1985; J.D., 1988). She resides in Fair Oaks, California.